SpaceX's uncrewed Dragon cargo capsule splashes down in the Pacific Ocean west of Baja California on May 11, 2016 after returning from the International Space Station. SpaceX is pretty serious about this whole spacecraft reusability thing. The California-based company landed the first stage of its Falcon 9 rocket for the fifth time early Monday morning (July 18), during the launch of its robotic Dragon capsule toward the International Space Station (ISS) on a cargo mission for NASA. "I thought it was 11 or 12 — something like that," replied Hans Koenigsmann, vice president of flight reliability at SpaceX. "So, not too far from now." SpaceX-11 is currently scheduled to lift off from Florida's Cape Canaveral Air Force Station in February 2017, and SpaceX-12 is slated to launch two months later, according to Spaceflight Now. 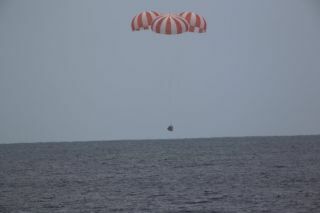 Dragon returns to Earth in one piece, making a parachute-aided splashdown in the ocean. This capability distinguishes Dragon from the other resupply vessels that currently fly to the ISS — Orbital ATK's Cygnus spacecraft, Russia's Progress freighter and Japan's H-II Transfer Vehicle — all of which burn up in the planet's atmosphere when their missions are done. SpaceX has retrieved every Dragon capsule that has come back from the ISS, but the company has yet to refly one. "The whole goal is to lower the cost of space travel and space transportation," Koenigsmann said of SpaceX's commitment to reusability. "Ultimately, I think we will enable lower transportation costs and provide much cheaper access to space based on that." Along those lines, the company also aims to retrieve and reuse the payload fairings that encase satellites during launches, he added. "We've been working on that," Koenigsmann said. "There are going to be modifications on the fairing, and then we're going to test this out again. I don't think I have a schedule on that; it's going to be a couple more missions until we can work that out." SpaceX is also developing a crewed version of Dragon that is scheduled to begin flying NASA astronauts to and from the ISS next year.